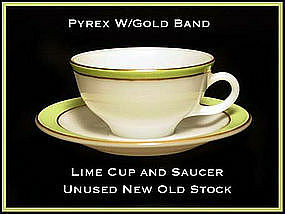 This Pyrex dinnerware was never used and is estate fresh from here in Ohio. Each piece is signed PYREX in gold, and the trim is fabulous! Total is a service for 12 with extras. 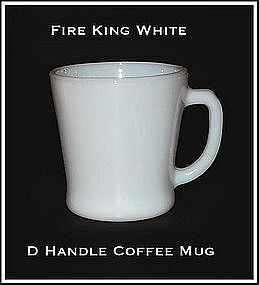 White Fire King 8 oz D handle mugs in excellent condition. 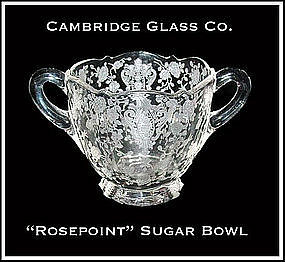 Cambridge Glass made this Rosepoint sugar bowl in the 1930s or so. We are unsure of the blank. Excellent condition! 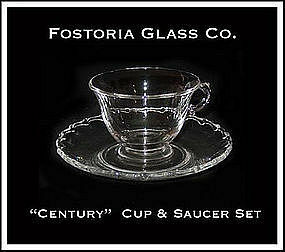 Fostoria Century pattern 6 oz cups and saucers in excellent condition. Simple elegance at its finest! 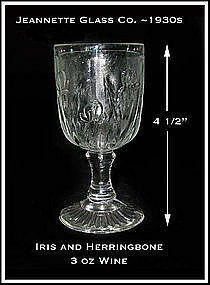 Crystal Iris and Herringbone 3 oz stemmed wine goblets in excellent condition. Very clean! 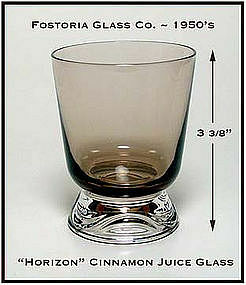 Cinnamon color "Horizon" was made by The Fostoria Glass Co. in the early 1950s. These juice glasses, and all of the other Horizon we have listed was never used and is fresh from an estate here in Ohio. Super condition! 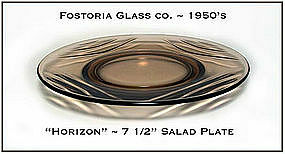 Cinnamon color "Horizon" was made by The Fostoria Glass Co. in the early 1950s. These water tumblers and all of the other Horizon we have listed was never used and is fresh from an estate here in Ohio. Super condition! 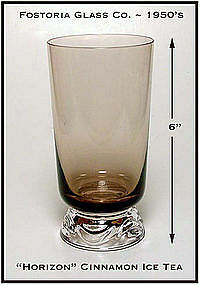 Cinnamon color "Horizon" was made by The Fostoria Glass Co. in the early 1950s. 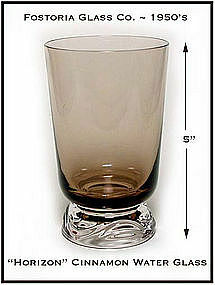 These tumblers and all of the other Horizon we have listed was never used and is fresh from an estate here in Ohio. Super condition! 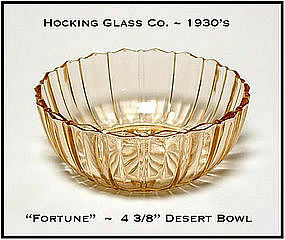 Cinnamon color "Horizon" was made by The Fostoria Glass Co. in the early 1950s. This creamer and underplateplate, and all of the other Horizon we have listed was never used and is fresh from an estate here in Ohio. Super condition! 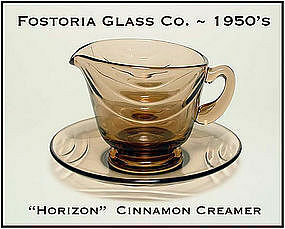 Cinnamon color "Horizon" was made by The Fostoria Glass Co. in the early 1950s. These salad plates, and all of the other Horizon we have listed was never used and is fresh from an estate here in Ohio. Super condition! 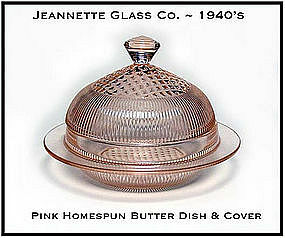 This pink Homespun butter dish cover is in excellent condition with no chips, and no damage. The base has a chip on the inner rim. 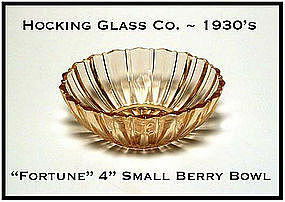 It was made by the Jeannette Glass Co. in the 1940s. Super! Only made for 2 years, these pink Fortune small dessert bowls are in great condition with no chips, and no damage. Bright and shiny! Only made for 2 years, these pink Fortune small berry bowls are in great condition with no chips, and no damage. Bright and shiny! 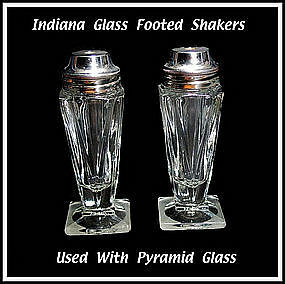 You are buying a pair of Pyramid style crystal footed shakers made by the Indiana Glass Co. in the 1930s. These weren’t really part of the Pyramid pattern, they just go with the Pyramid pattern and the collectors of this pattern use them since they go-with it so nicely. They do have ground bottoms, and are 4 inches tall. The cork washer is missing on the one shaker, but they are available. We will gladly combine shipping on multiple purchases. 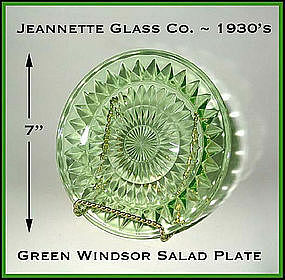 Green Windsor salad plate made by The Jeannette Glass co. in the 1930's. No damage, and no repairs. 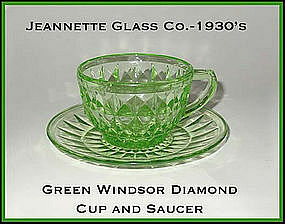 Green Windsor cup and saucer set made by The Jeannette Glass co. in the 1930's. No damage, and no repairs. 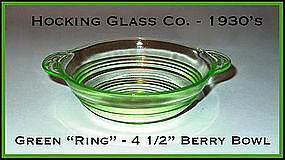 Small berry bowl, companion to the larger Green Ring 2 handled berry bowl we also have listed. 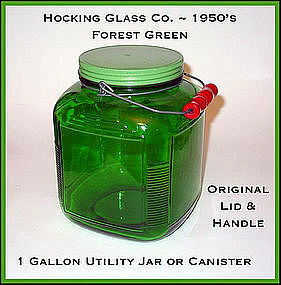 Made by Hocking Glass Co. in the 1930's. Excellent condition!